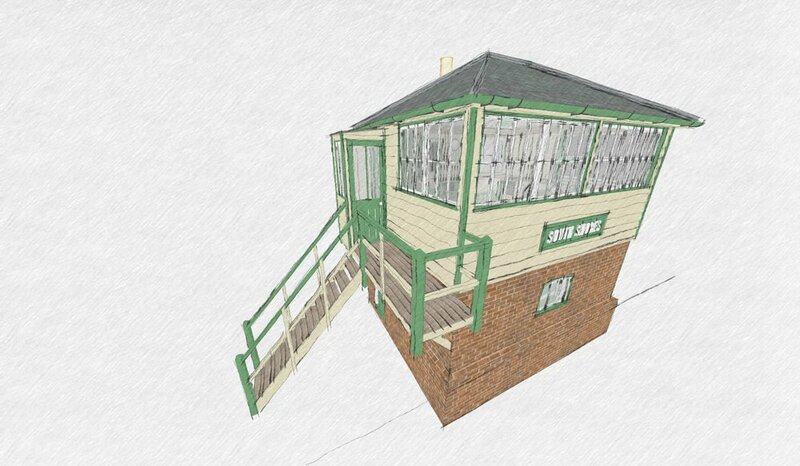 The humble signal box has been a mainstay of the railway scene for centuries, providing a place for signalmen & women to set routes, signals, and block systems. This was crucial to the safe working of any railway, making sure trains were set on the correct lines, and keeping them at safe distances apart. No matter what size of cabin, they all functioned the same; "lever frames" (literal rows of large levers) were used to control points and signals. The levers were connected to a bewildering array of pulleys, wires and linkages as they came out the front of the box where they linked to metal rods. These rods then ran to the necesarry signals or points. Not only was this a pretty awkward arrangement, and a costly set-up, but the length of these rodding runs was limited to a few hundred yards - any longer and the strength needed to pull the lever in the signal box would be more than a human could manage! It's fair to say that signal boxes were often as elegant as the stations they often served - since they were tall structures, they were pretty prominent, and so many railway companies were keen to design cabins that looked smart, and that showed off their company livery. But such signal boxes/cabins were not always there - originally each point and signal was operated locally, meaning the signalman had to walk between each one for every train that passed. It was only in 1843 that the first signal box was built - on the London and Croydon Railway. It wasn't long before other railway companies saw the huge advantage of having these centralised buildings that were capable of controlling multiple apparatus in one place, and set about constructing their own regional variants. 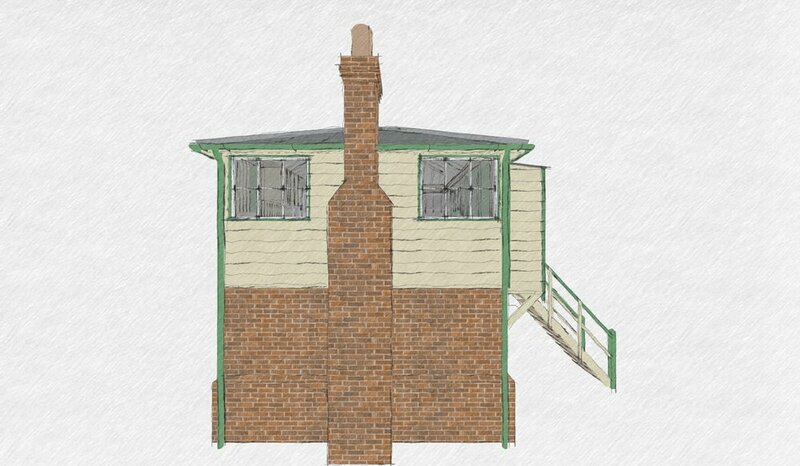 These cabins ranged in size from the diminutive single storey glorified wooden shed (known as ground frames), to the colossal brick built 2 storey boxes - where they controlled large junctions and stations. For this blog entry, I'm going to focus on one railway company: the London and South Western Railway. Much like other companies, the LSWR started off with a mix of designs - ranging from all brick structures with small windows, to fairly elaborate wooden boxes. In 1871, they decided to start standardising designs, and introduced their Type 1 box. This was a small, dumpy wooden box on either a brick or stone base. Although the design was somewhat utilitarian in appearance, the early versions all had decorative bargeboards (although many of these were later removed), and the 8 pane sliding glass windows gave off a charming cottage feel. This is the type of box I decided to try and replicate - both because I think they are rather adorable, but also because despite being pretty tiny, they would be big enough to convert into a lovely holiday cottage, whilst keeping within the limits of square footage I prefer to design. (Anything under 30 sq ft). The LSWR later went on to design large and more fancy structures - in some cases, the modular designs of which would mean there were some rather large examples! Needless to say, the days of these mechanical signal boxes were numbered once electronic replacements were developed. Many lever frames were then torn out and replaced with electronic panels. Sadly, in many cases the charming traditional boxes themselves were demolished, and modern replacements built in their place. It is of my opinion that the vast majority of replacement buildings never came close to the architectural charm of the originals, although I guess some people will beg to differ! Aesthetic is a matter of subjectiveness, after all. In any case, even some of these modern replacements didn't last long - some only a handful of years before they were superceded with regional signalling centres. These centres are completely electronic based, and don't even need to be within sight of the railway. Back in 2012, Network Rail (the company that manages rail infrastructure in the UK) started replacing the remaining 800 "signalling locations" with 14 of such regional signalling centres. As can be expected, such a huge undertaking is set to take up to 30 years, covering the whole of the UK; with 80% of the work estimated to be finished in half that time. To help explain the sheer scale of the signal boxes demise, consider that as of 2012, only 500 boxes remain on the mainline, as opposed to over 10 000 existing at the end of WWII. Fortunately, as part of the "improvements", English Heritage has carried out a major survey of remaining (unfortunately not those that are no longer in use) signal boxes still in operation (as well as those on heritage lines and museums) to identify boxes worth preserving. 26 such boxes have since been given Grade II Listed Status, thus safeguarding their future. What happens to the rest of them? Well, only time will tell! The fortunate survivors will be restored, either in their original location, or moved elsewhere. Some may be turned into cafes, museums or holiday cottages. The unfortunate ones will be demolished, with no trace left whatsoever of their important role in railway history. With regard to the LSWR Type 1 boxes, a few do still exist; a notable example being at Instow, Devon (built in 1874) - on the old Barnstaple - Bideford line (its passenger services ceased in 1965, with freight continuining until 1982. The line was then lifted 3 years later, and has since been converted into a cycle way). 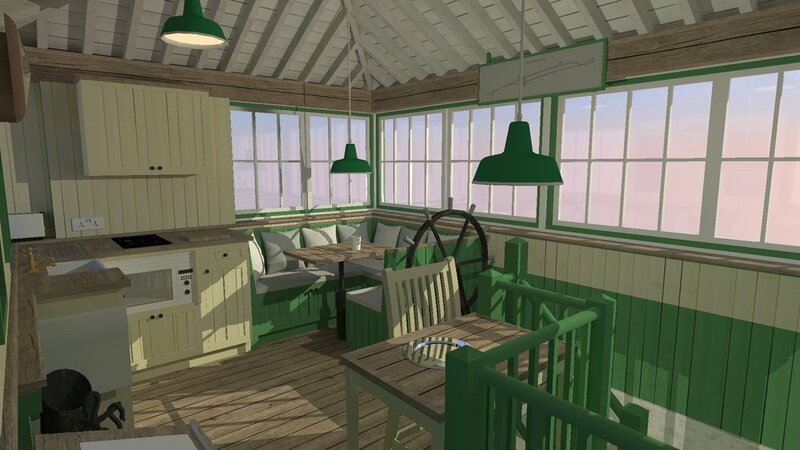 The box at Instow has been completely restored - looking exactly as it did when last in daily use, complete with original fittings and furniture. 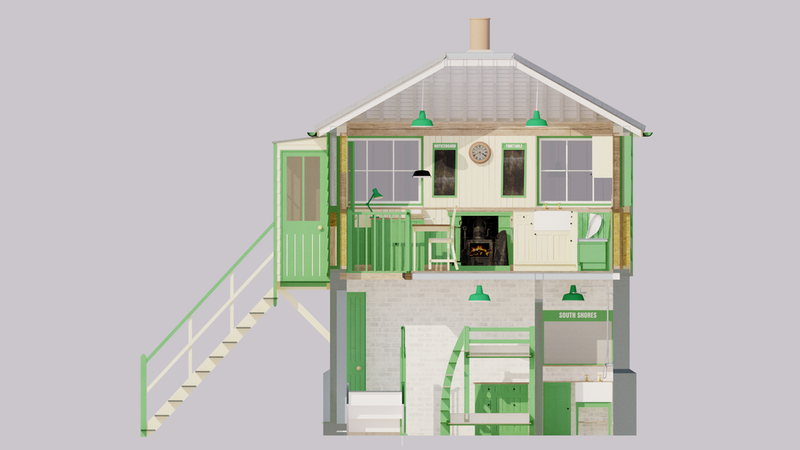 Amazingly, it was only community intervention that stopped it from being completely demolished - it being the first listed signal box in the UK. As an example of the continuing loss of signal boxes, during research for this blog entry, I sadly discovered that Wool Signal Box was demolished on Sunday 31st May 2015. We used to camp in the neighbouring campsite and I always found the signal box such a lovely quaint structure, I used to run up to it whenever I heard a train approaching to watch it pass. I was going to link a street view image of it, but realised it was no longer there - and along with it went Hamworthy and Poole signal boxes, thanks to a re-signalling project. Very sad news indeed, and it just goes to show the continuing needless destruction! Whilst NR say they do try and salvage some stuff, a lot of it (usually including the centuries-old lever frames) will be skipped. 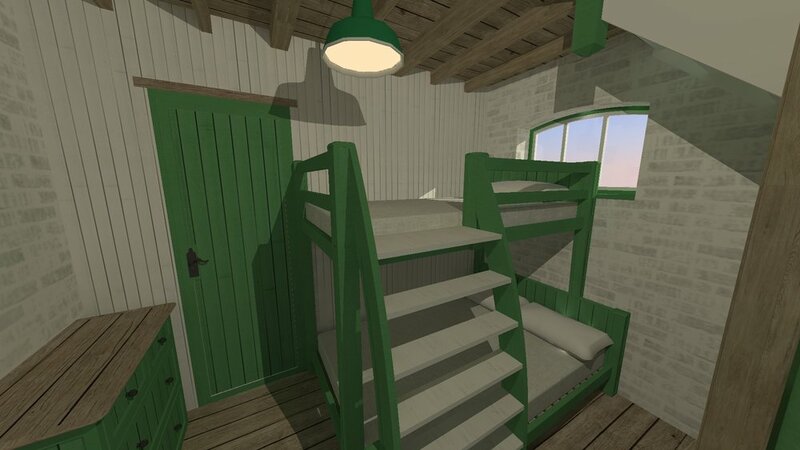 The cabin has a basic upside-down layout, with a bedroom and wetroom downstairs, and everything else being upstairs. This arrangement makes best use of the views and natural light, which is in abundance upstairs. Straight away you'll note that I've kept the green and cream paint scheme of the LSWR box at Instow. It's fair to say I have a soft spot for this colour scheme, and as per the real thing, I've continued it inside. I will admit that perhaps the yellow/cream colour would be better painted a more neutral white for the interior, but I was keen to keep the aesthetic as traditional as possible. Unlike most (but not all) boxes, this one sits at ground level - most are actually sunken part way into the ground, with brick steps leading into the lower level (called the "locking room" after all the interlocking equipment). 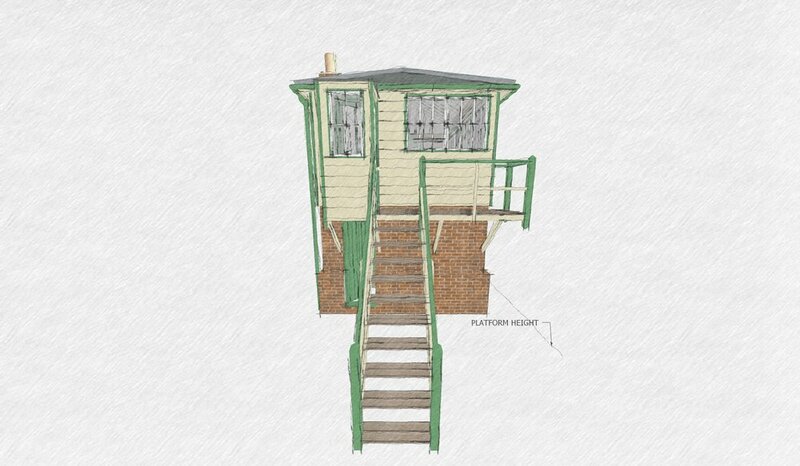 I've kept the steps and balcony as prototypical as possible; you'll note the balcony extends a little bit infront of the signal box - this is so that the signalman can exchange tokens with the locomotive driver or fireman. Such tokens allowed them access to the next section of track (called "block sections"), and they would not be allowed to proceed without them. 3/4 VIEW - The sliding windows on 3 sides allow plenty of cross ventilation. Also worthy of note is the balcony that extends beyond the front wall of the cabin. A porch provides a sort of airlock to keep draughts out of the cabin, but is too small to be used as any kind of storage for shoes etc. You could probably put a coat hook on the back wall though. Something that might be strange to most people is the entrance door on the lower level. I can understand that some people might not be comfortable with a direct route outside from a bedroom, but to be honest I saw no benefit with removing it and blocking up the doorway. Again, I want to keep it prototypical, but also a 2nd exit can only be a good thing - not only is it good from a fire safety standpoint, but also helpful when trying to get furniture in and out. 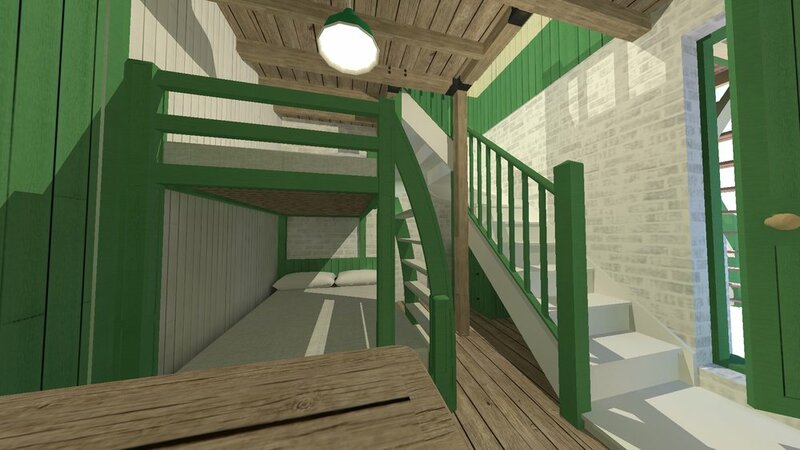 The lower level of the cabin is a 250mm thick cavity wall made of brick, with a traditional step-out at the bottom which would match up in height to 2 bricks above the top of a railway platform. The upper storey is entirely wooden (with the obvious exception of the slate roof and the chimney). Wooden framed windows are the order of the day, with the main front and side elevations featuring sliding windows. All other windows are fixed. The overall look and feel is pretty accurate to the prototype, although having had no dimensions to work from, the exact proportions may be off slightly. I also think the eaves overhang is a little on the generous side! So, onto the inside, and we'll start with the smallest room first. The wetroom is pretty typical of my designs, but I've kept the railway theme going with custom furniture and a traditional ceramic sink. The toilet is also of the old high-cistern Victorian style, and the mirror is mounted on a LSWR noticeboard. (You'll see two more of these upstairs). I've gone for a dark grey large tiled floor for a nice contrast, with standard LSWR light fittings (albeit without the traditional gas lighting!). 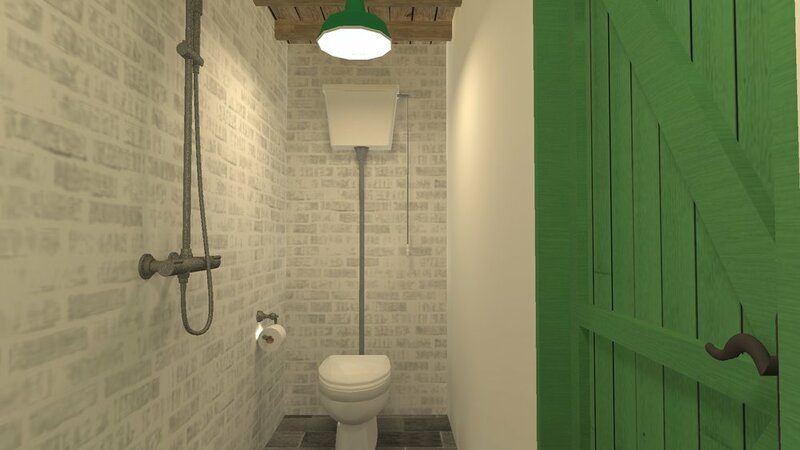 A classic green wooden door finishes off the look, completing the small but smart wetroom. Due to severe space limitations thanks to the stairs, there isn't much room in the bedroom. In order to cater for a couple and one kid, I decided to design a bed similar to the one used in my Living Van design - where a single bed sits above a queen size bed. Obviously this is far from ideal, but in such a limited space, the only option is to go upwards! The cubby under the stairs is used for a set of drawers for clothes, with a second unit shown next to the wetroom door. All the interior brickwork has been painted white to keep the space as bright as possible, since there is only one small window for the whole of the bottom floor. I'll suggest an alternative lower floor design in the final thoughts section later! So moving upstairs, this is the real hub of the cabin. As soon as you reach the top you are greeted by a large wheel that resembles an old ships wheel. This is actually a gate wheel; originally used to open and close level crossing gates. Obviously it won't actually be connected to anything in this case, but I wanted to try and keep as much of the original box within my design as possible, and I thought the gate wheel would be a fun way to do it. 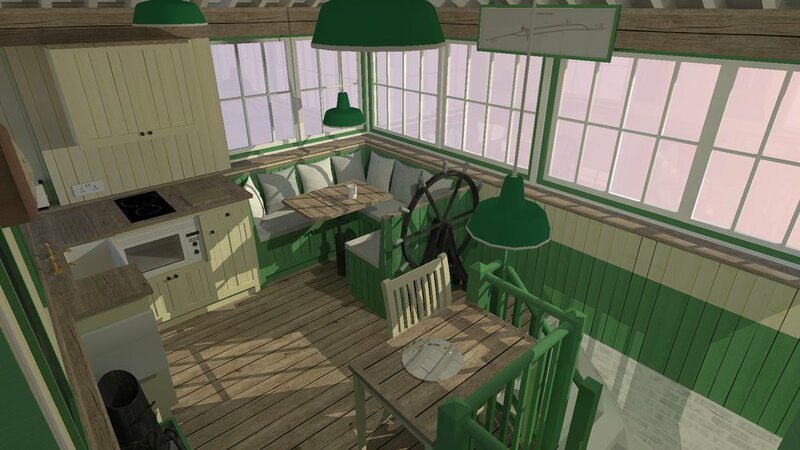 To your left is a traditional table and chair which I've modelled based on those usually found in signal boxes across the UK. Adjacent to that on the back wall of the cabin is a narrow cupboard which would have traditionally housed cleaning materials to keep the box spick and span, on top of which is an adjustable lamp and an angled writing surface used to make notes and record events. A coal stove takes pride of place in the middle of the back wall, with a classic coal scuttle and associated tools on the hearth. This should easily keep the cabin a comfy temperature in the winter! On the wall above is a classic LSWR clock and the 2 aforementioned LSWR style noticeboards/pinboards to keep the railway theme going. As we head to the right you'll see the kitchen area, with another large ceramic sink and classic Victorian taps. I've decided to keep these kitchen units cream rather than green as they probably would have been since green is a pretty dominating colour, and the cream will help to make the space feel a bit bigger than it really is. If you look closely, you'll notice the units on the back wall are a bit narrower than the units on the other wall to keep them from blocking the walking space. I've decided to add a microwave oven that can be hidden from sight by using a door that is pulled out and across. My desire to hide modern conveniences hopefully helps to retain the original atmosphere of such utilitarian cabins. As such, I've shown an electric induction hob which can be stowed in one of the cupboards when not needed. 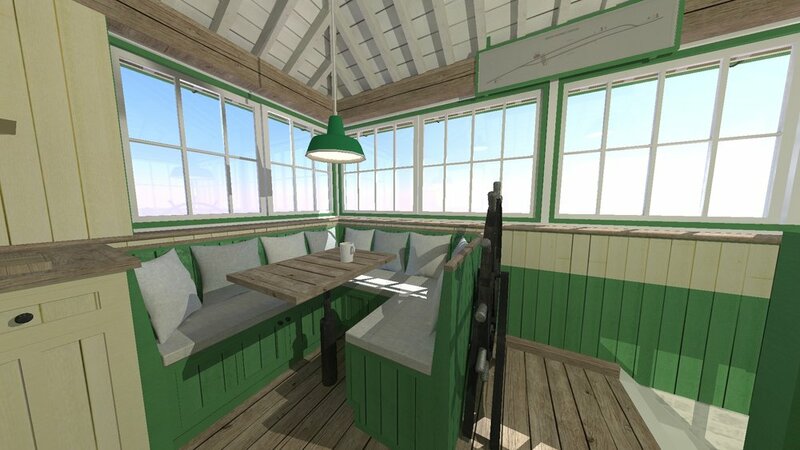 And that brings us onto the final area - the dinette. This is fairly similar to the Norwegian Tiny House that I designed, but obviously this one is custom fit to the space, and is in the appropriate colour scheme. Neutral grey cushions add a subtle bit of modern style. As usual, underneath the dinette seating is plenty of storage space. The table is a gas-lift table, meaning it can be lowered; with a cushion added on top, you can create a comfy day bed. Aesthetic wise, I've kept the bare floorboards and exposed joists and rafters as per the prototypes, but I've decided to paint the ceiling and rafters white to give a sense of greater volume. The walls are traditional tongue and groove siding, with split tone painting. You may also note I've included a fake signalling diagram on the front wall to reinforce the railway theme, and I'm sure you could also add block token machines/instruments on the window sills around the cabin. Overall, I hope that the conversion I've designed has been sympathetic enough to not detract from the original structure. Whilst obviously the lever frame would have to be removed, I'd hope a museum or heritage line would be able to make use of it, and if not then I'd integrate as many parts of it as possible into this design. Whether or not I've kept it as authentic as railway buffs and historians would like it to be is up for debate, but you can't say I haven't tried! As mentioned earlier, I'd like to quickly discuss a potential change to make the bedroom more usable. As these Type 1 boxes were notoriously crampt (especially considering the lever frame would take up half of the inside space), many were later fitted with extensions - usually on the upper floor, but sometimes on the lower floor too. Whilst I'd be very hesistant about adding something like this onto an existing structure, if it was designed to be in-keeping with the original box, it could allow for a more spacious interior. Many such extensions were built to house toilets, so a wetroom extension on one of the two floors would not be a bad thing, and would leave the entire bottom floor as being the bedroom. Obviously I'd much rather keep the design as true to the original as possible, so it's not something I'd be keen on doing. 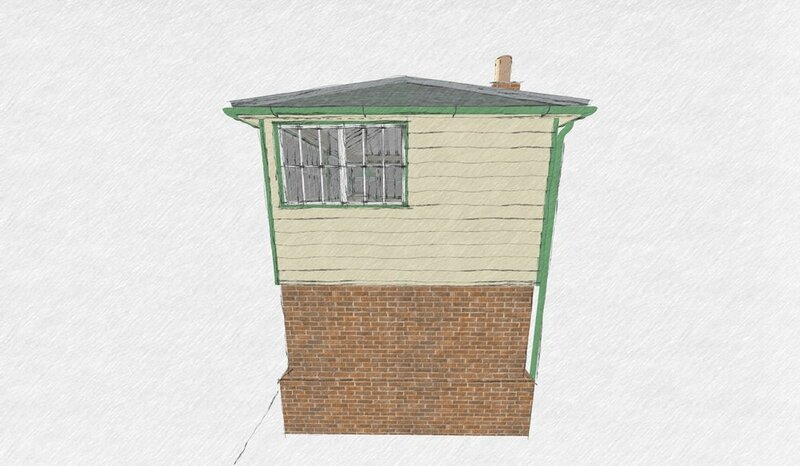 That said, since many such signal boxes were fitted with extensions, perhaps you'd be lucky in finding one already built! Anyway, that's about it for this months blog entry. As always, if you have ANY feedback or suggestions I'd love to hear from you - these blog entries take a LONG time to write and prepare. And I'm always on the lookout for suggestions for suitable projects for future blog entries! Induction Cooktop - Michel A. Industrial Pendant Lights - Celeste H.